The warm, gleaming glow of fall returns with Great Pumpkin LumiNights at Dollywood’s Harvest Festival, starting Sept. 28. The Great Pumpkin LumiNights are back at Dollywood this September. 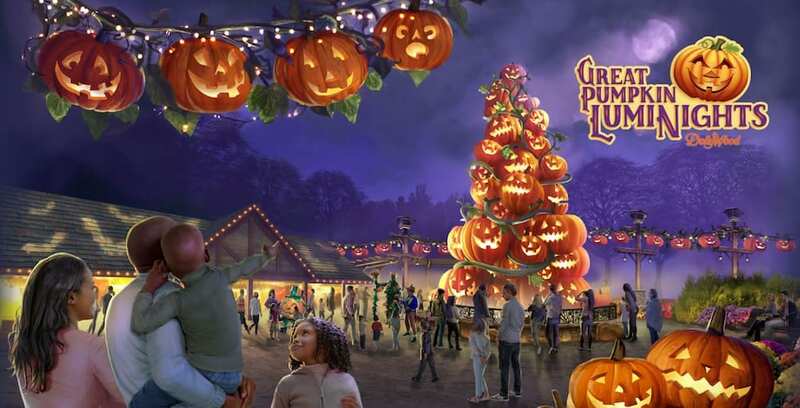 A guest-favorite last year, Great Pumpkin LumiNights will return with new immersive harvest-themed displays, activities and a footprint that’s more than twice the size of 2017’s version. The event will run for six additional days this year, from Sept. 28 – Nov. 3, from 10 a.m. – 9 p.m., giving guests more time to enjoy the fall fun. Last year’s pumpkin displays, like the pumpkin spider and the pumpkin dance party, will be joined with elaborate new additions, including a couple of Dolly Parton-inspired displays. The Plaza at Wilderness Pass will serve as the centerpiece for the event, and include an area for character interactions, additional displays, and a 40-foot-tall carved pumpkin tree. Guests can bask in the glow of the thousands of carved pumpkins as they pass by the displays throughout Timber Canyon, Wilderness Pass, and upper Craftsman’s Valley. Along with the displays, families can find “pumpkin artists” who will host demonstrations to teach how to produce a pumpkin masterpiece. In addition to the Great Pumpkin LumiNights, some of the biggest names in Southern gospel music will perform during the Southern Gospel Jubilee. Over 625 individual performances will take place on stages throughout the park during the festival. During the Harvest Festival, over 30 visiting artisans from across the country will bring their wares and share their talents with Dollywood guests, including textile art, inspirational jewelry, paper marbling, rug hooking, fiddle and dulcimer making, and more. To learn more about Dollywood’s Harvest Festival, Great Pumpkin LumiNights and Southern Gospel Jubilee, visit Dollywood.com.